For ALL types of promotional needs such as Family Celebrations, Sports Advertising boards and complete event packages. 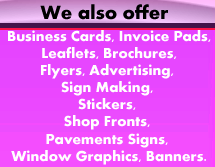 Business Cards, Invoice Pads, Leaflets, Brochures, Flyers, Sign Making, Stickers, Vehicle Graphics, Shop Fronts, Pavements Signs, Window Graphics, Banners. 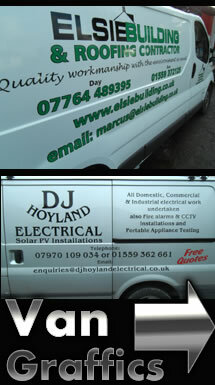 Vehicle graphics for Carmarthenshire, Ceredigion and Pembrokeshire areas of Wales. Whatever your budget is we can help you bring your ideas to life with free no obligation advice, quotes and designs.